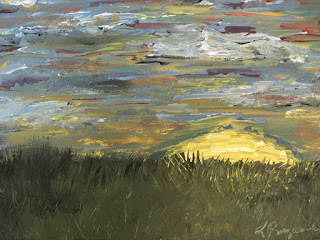 Last month I had planned on attending a plein air painting gathering at the edge of the Everglades while the sun set. Unfortunately we had such terrible storms that day, that the event was cancelled. So as I had that timeslot open, I decided to do a Facebook Live while I painted a sunset over the everglades, just from my imagination. I had to edit the video because I couldn't figure out how to turn the Facebook Live off LOL! The painting is available for sale in my Etsy shop KarenPruzanskyDesign. Enjoy the videos and if you have any questions about paint brand, colors, tools or techniques I used, feel free to comment below.